Remember that God doesn't change his character depending on how he wakes up in the morning - We can pour our hearts out to him because he is Faithful and just. 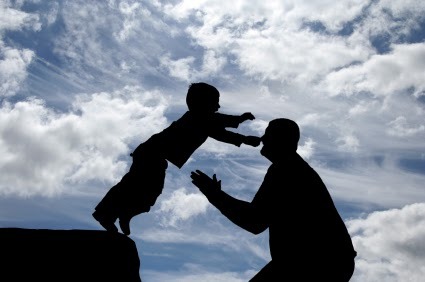 Sir Isaac Watts wrote: "Learning to trust is one of life's most difficult tasks." And our defence is sure." May we trust in God's grace and favour AT ALL TIMES. The other evening I noticed how many moths are drawn to the lights. 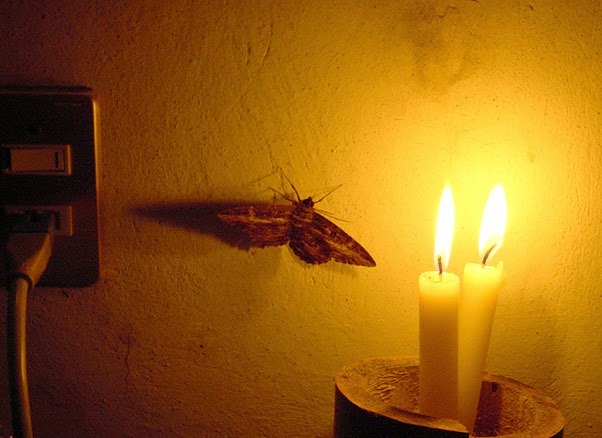 Start some kind of flame or put on a light and they are immediately drawn to it. The tragedy is that what draws them to light ends up killing them, as they get burnt by the flames (or light globe). Sin has the same effect on us. It draws us in because it looks "brilliant" and "bright", but in the end it only burns us. So, today I urge us all to be conscious of what motivates us and what draws us into its brilliance - it may not be what it pretends to be. Romans 5:21 - "...so that, just as sin reigned in death, so also grace might reign through righteousness to bring eternal life through Jesus Christ our Lord." Sometimes we just have too much on our plates - as the saying goes, "we have a full plate!" Of course, this idiom could be referring to actual food on our plates, but for most of us it applies to the busy lives that we lead. We have so many things to do, that we wonder if we will ever get through the long list. Of course, we easily justify that being busy is much better than being lazy or ill-disciplined. 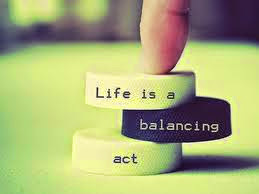 However, we need to find a healthy balance in all things. Being idle is not godly, but neither is being too busy. It is a fine line to walk and often I don't get it right. I am not sure about you? How is your schedule looking at the moment? If you are feeling overwhelmed then perhaps you need to plan a little time away from the rush of life and to ask God to help you to get back into balance. 1 Timothy 5:13 - "Besides, they get into the habit of being idle and going about from house to house. And not only do they become idlers, but also busybodies who talk nonsense, saying things they ought not to." Sometimes we just need to allow the scriptures to speak to us. Wherever you are in the world right now, tell me what's the temperature? If you are in the Northern Hemisphere then you are probably enjoying a cool spell. In Pietermaritzburg we have been frying over the last week. Temperatures have been soaring into the upper 30's, with the humidity taking this nearer 40 degrees - it is hectic. 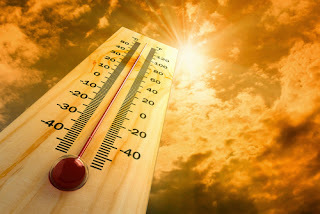 Psalm 32:4 - "...my strength was sapped as in the heat of summer." I think LIFE can be a lot like the heat that drains us. Life can drain us too. Situations we face can caused us to feel emotional/spiritually drained. It is like we have no respite from the heat - Life just bears down on us. "The Lord watches over you— the Lord is your shade at your right hand;"
And in the end of it all, there will be no heat what-so-ever. Awesome news! There is a quote that has been troubling me all week. I used it in my sermon tonight and it is still swimming around in my head. You could swap the word "impact" with the word "influence" and it still makes for challenging reading. If what we are doing in life, doesn't make a positive influence on the lives of others, then perhaps we need to re-evaluate what we are doing. This goes beyond our work situations - it spans everything aspect of our lives - family, friendships, church, community, country and so on. Let's commit to do what we can to influence our world/town/school/work place. 1 Samuel 15:17 - "Samuel said, “Although you were once small in your own eyes, did you not become the head of the tribes of Israel? The Lord anointed you king over Israel." "The thought crossed my mind!" When we say this we can almost picture that "thought" popping into our minds and then floating into the distance. Sometimes we need to allow that thought to lodge in our minds and to act on it. 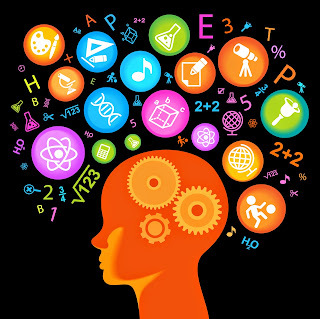 If we allow too many thoughts to cross our minds, without holding onto them, then we run the risk of just 'thinking' about things and not acting. So, if you have a constructive/helpful thought cross your mind today, then please act on it - it may just bless someone else's life. Psalm 10:4 - "In his pride the wicked man does not seek him; in all his thoughts there is no room for God." Isaiah 55:9 - “As the heavens are higher than the earth, so are my ways higher than your ways and my thoughts than your thoughts. Most of you know this already, but let us hear it again. 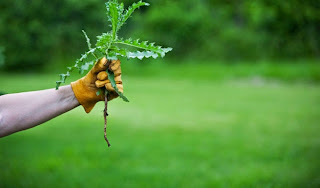 It is no good cutting the weeds in our gardens, we need to actually uproot them. It may look like we can get rid of them, by simply cutting them with the weed-eater, but in a few days they will grow back. It is the same with the sin in our lives. We mustn't fool ourselves and merely think that we can "cut it out" for a while - we need to uproot these areas in our lives and then ask God to fill the gap with his grace and love. So what 'weeds' need some uprooting today? Matthew 15:13 - "He replied, “Every plant that my heavenly Father has not planted will be pulled up by the roots." Matthew 13: 40 - “As the weeds are pulled up and burned in the fire, so it will be at the end of the age." Uproot the sin in your life - don't just cut it down for a few days! We all need a goal to work towards - or at least I do. I find that the motivation to achieve something needs to spur us onto greater things. So, if I am going to be doing some event (like a race or even swimming Midmar), then I know that I have to train. One can even up the ante when you register for the event and pay the money. In this way, you are committing to the process, planning to complete the achievement and feel that wonderful rush of accomplishment. So, can we not do the same in our spiritual lives? Perhaps the goals seem a little more vague, but we can still measure them. What kind of spiritual training should we be doing this year? I am not sure that we should be aiming to be "successful" Christians, because that doesn't seem like a healthy goal - perhaps a better focus would be to become more Christ-like. This we can do on a daily basis. 1 Corinthians 9:25 -Everyone who competes in the games goes into strict training. They do it to get a crown that will not last, but we do it to get a crown that will last forever. 1 Timothy 4:8 - For physical training is of some value, but godliness has value for all things, holding promise for both the present life and the life to come. Start your day off with Christ and invite him to be part of your thoughts, words and actions. Start small and see what God does in your life. How far would you go to save someone? What would you be prepared to do if you knew that something was on the brink of extinction? It's a tough question I know, but one we need to think about, as we may be confronted with it pretty soon. Midmar Mile. I am honoured to be joining about 100 swimmers who are swimming for various charities - I will be swimming in aid of "Save the Rhino" foundation. Last year 1215 Rhinos were poached in South Africa (according to today's Mercury Newspaper), which is 100 times more than 2007. To put that in perspective - that is 3 Rhino's a day. We can't let this continue and so I would like to do my small bit to make a difference. How it works is that we swim in all 4 races on the Saturday and then all 4 events on the Sunday. 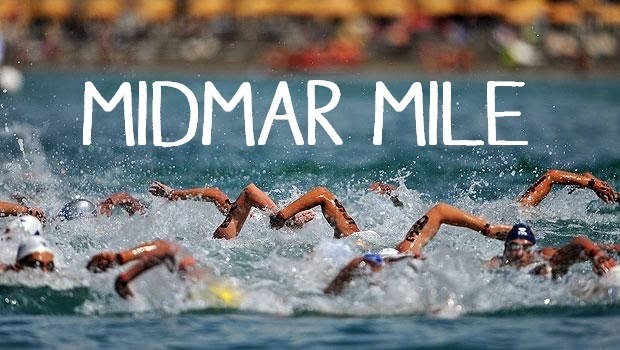 Basically we swim a mile, jump into a boat and go back to the start and then swim another mile. By the end of the weekend we would have each completed 8 miles and hopefully raised enough money to make a difference. The world is obsessed with being "better" and "bigger" than the next person. And the sad thing is that we are willing to step all over other people in order to get ahead of others. 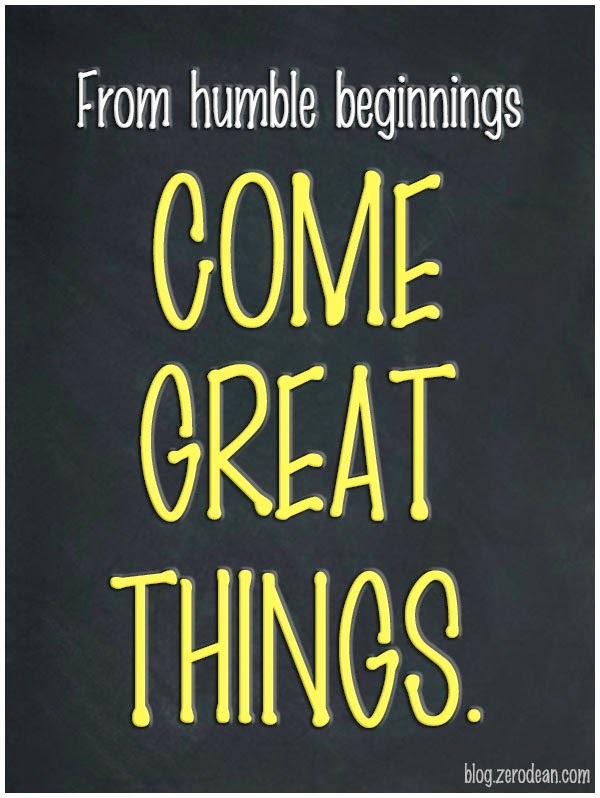 If we are going to begin afresh this year (or week/day) we need to recognise that there is nothing wrong with humble beginnings. God spoke through Job when he confirmed that although our beginnings may be small and insignificant, they will lead to an amazing future. So if you are considering starting something today, don't be put off my "instant results." 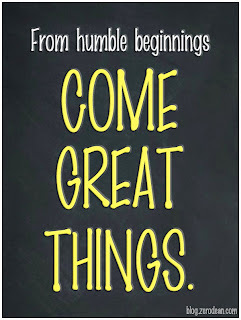 Trust in the power of God to turn our humble beginnings into great things. 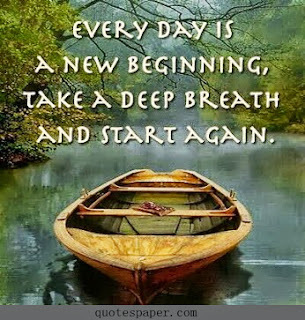 It touches on the powerful sentiment of Beginning again. There are many of us who would love to begin this year over again OR who may even just want to start afresh in our faith. The beauty of belonging to Christ, is that we don't have to search for the 'Land of Beginning Again' because we have a friend in Jesus - He is the person who allows us to begin again. If you find yourself in the place of wanting to begin over again, why don't you stop for a second and pray - ask the Lord to help you to move from the past and to embrace a fresh start.